This medical thermoformed tray leak detection system incorporates modi­fications to a medical validatable thermoformed tray rotary blister sealer. It adds an upper platen drive mechanism that applies vacuum to thermoformed tray samples for evaluation of vacuum decay or loss in sealed medical trays. The station compares known “good thermoformed tray medical packages” with a standard vacuum loss through transmittance across the “Tyvek lid stock” to a variation of greater loss due to a failure in the seal area itself. This base option will include an upgraded vacuum system and surge tank along with individual sensor systems for monitoring drops in vacuum related in inches of mercury and millibars. 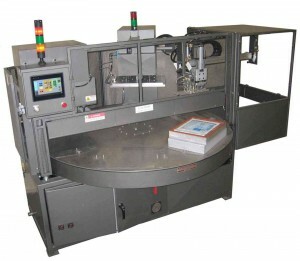 System will include an upgrade of the rotary blister tray sealer itself to include; programmable controller, and operator interface screen as well as job memory log for retaining the parameters on various package designs. Click here for information on thermoformed trays for medical packaging.